TOA Canada - Would you please recommend the required speaker tap settings? Would you please recommend the required speaker tap settings? Would you please recommend the required tap settings on the speakers below (Hospital standard). Will 1.5W be enough? As I understand the next available setting of 5W on these speakers would be very high. Please also recommend amplifiers (Class-D) for all 3 channels. Thank you for contacting TOA. Without knowing what the ambient noise levels are for your zones it is hard for me to comment on what level would be enough. What I can comment on is what levels you will get based on the ceiling height and tap chosen for your speakers. On the 1.5W tap at a listener height of about 6' the SPL would be approximately 92dB (91.76dB to be exact). On the lowest tap available for the F-2352C, 0.5W, you would get 87dB. Ideally you want to be 10-15dB above ambient noise level for intelligibility. I have included a chart on sound levels and perception examples. As for the recommended D-class amp, since we do not have a 3 channel model I would recommend the DA-250FH (4 channels of 250W @ 70.7V). We also have a 2 channel unit, DA-250DH (2 ch. of 250W @ 70.7V). To learn more about SPL, visit Soundoh. 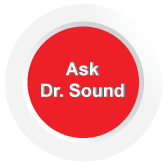 Have a question you'd like Dr. Sound to answer? Send it to Dr. Sound and he will answer it right away. It may even appear in next month's newsletter and you will receive a free T-shirt for winning the Tech Tip of the month submission!